The Work Sharp WS3000 Wood Tool Sharpener is an easy-to-use dry sharpening system for chisels, plane irons, lathe tools, carving tools, and other woodworking tools. Designed for the serious woodworker, this sharpening system is packed with unique features that make it easy to achieve consistent angles on flat blades and contoured tools.Precision tools like small chisels are extra tricky to sharpen freehand on large, rough wheels. That's why the sharpening port on the WS3000 is so innovative. This port, which handles blades from 1/8 inch to 2 inches, makes it incredibly easy to sharpen the bevel on small tools from underneath the wheel. Angles of 20, 25, 30, and 35 degrees are set in the machine, so you don't need an extra jig or a special tool to ensure that you are creating a bevel edge with a consistent, effective angle. You can also achieve a perfect five-degree micro-bevel for fast re-honing. An adjustable fence in the port keeps the tool square during sharpening, and when you pull the tool back out of the port, a ceramic oxide lapping abrasive automatically removes the burr on the back of the tool for a clean finish and a sharp cutting edge. And when it comes time to sharpen contoured tools, you can slip an innovative slotted Edge-Vision wheel onto the WS3000. This lets you look through the wheel to see the edge of the tool you are sharpening from below, taking the guesswork out of maintaining lathe tools and other curved or v-shaped blades. 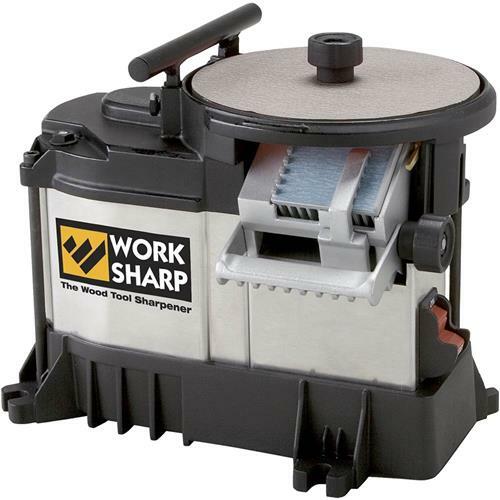 In order to avoid the hassle and mess of expensive wet sharpening systems, this dry system uses routed airflow from the motor and a special heat-sink design to keep your tools from overheating. This means you don't have to worry about damaging the edge you just created or ruining the temper of steel tools. To make all this possible, Work Sharp uses a quiet 1/5-HP motor that produces a high torque max wheel speed of 580 rpm. This low-rpm wheel maintains speed regardless of load for improved consistency, so whether your specialty is custom furniture, cabinetry, or old-fashioned wooden toys, you can rely on the WS3000 to keep your tools sharp and ready for use. This award-winning Work Sharp tool is backed by a full two-year warranty.